Marie Page Cleaning Services, Residential & Commercial Cleaning, Light Delivery and Shopping Services. A Cleaning Service For Your Busy Household or Business! Welcome to the Marie Page Web Site! Copyright © 2010 All rights reserverd. Marie Page Cleaning Services LLC provides both residential and commercial cleaning services, full janitorial services, complete floor care services (floor stripping, floor waxing, floor buffing), light delivery and shopping services. RE-CLEAN IT FREE OF CHARGE! Call (570) 629-7811 for more details. *Fax service available during office hours only! Marie Page Cleaning Services LLC are closed on all major holidays. Marie Page received an award for the 2011 Woman Entrepreneur for Northeast Pa on October 11, 2011 from the Small Business Development Center of Scranton. Click here to read about Marie Page in the article on Women in Business. Wishing you and yours the best for the upcoming Holidays Memorial Day, July 4th, Labor Day and Thanksgiving. 10% off your first cleaning when booking regular service. Two million dollars liability coverage. Employees are issued and show ID badges. 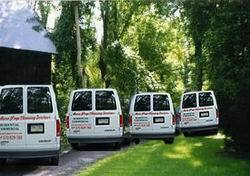 We operate a fleet of full service vans. 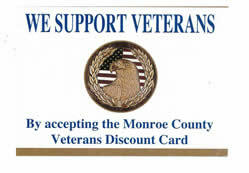 15% Discount when you show your Monroe County Veterans discount card.